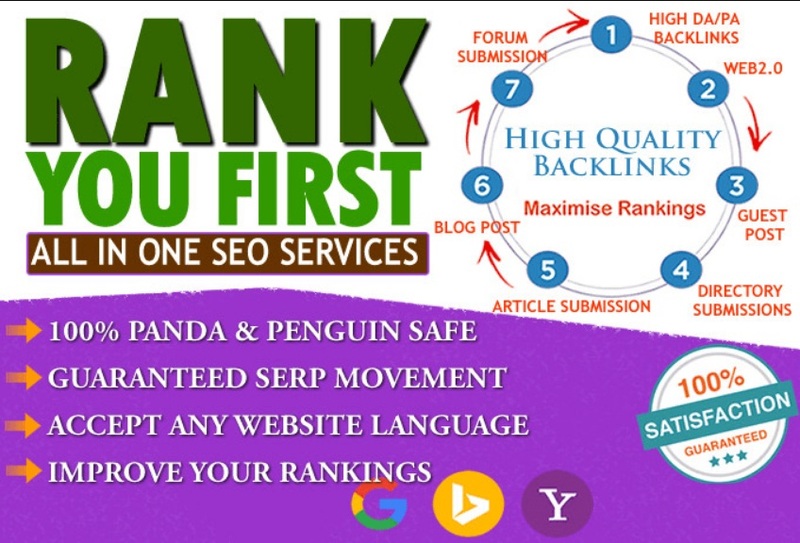 Rank your website Page #1 in Google with Powerful All in One Seo Backlinks Package for your website. Use Our All in One Seo Backlinks Package to rank your website effectively in Google, So Now's your chance to boost your Google rankings quickly with 4200+ High-Quality Backlinks. The SEO game is a constantly changing landscape. But 1 thing remains certain. These High Quality And contextual backlinks will ALWAYS perform effectively to prove to the search engines so that your websites are important and should rank highly for your desired search terms. =>> After using this service you get 100% results. Please note: the SEO is a little long-term process, So it may take few Weeks/months to get your website ranked in Google as there is many SEO factors Which are very important such as: Domain/page authority, Keywords competition, Social signals (Facebook, Google shares for website), On-site optimization, Domain age, Current rank & many other factors. We Decorate this SEO package to insure it will be the most effective within a defined budget. # Are these links do-follow? # Are these backlinks Google safe. # Do you accept all Niche Website? # Are these backlinks permanent? A: These backlinks are permanent in normal cases, as we use high-quality unique articles in submission and also submit in high-quality sites, but in few cases, the sites may bulk delete accounts/articles or sites may down after some time, so it's about 80% permanent. # Do you work in non-English sites? What about articles? A: Yes, we can, however, we use English related articles, with your exact keywords as you type in your language, it ranks well don't worry. Can you rank Facebook Fanpage or Youtube channel/videos in Google? A: Yes, our Service is working properly with Facebook fanpages, YouTube videos/channels, Google+ pages, twitter channels & any other social pages/channels. Also it will be much easier than the normal sites. # Will This SEO Service affect Alexa rank? A: Alexa rank is rating the visitors primarily, then getting the details of backlinks, so this campaign will give a good results in Alexa but keep in mind that visitors is the primary ranking factor. # Why Backlinks are not indexed/appear in backlinks, checkers? A: Generally getting your links indexed is important for SEO, We believe that Ahrefs spiders is less powerful than Google but it's still faster and should index most of the backlinks but after about 2 weeks and up to 3 months of getting these links indexed in Google search.